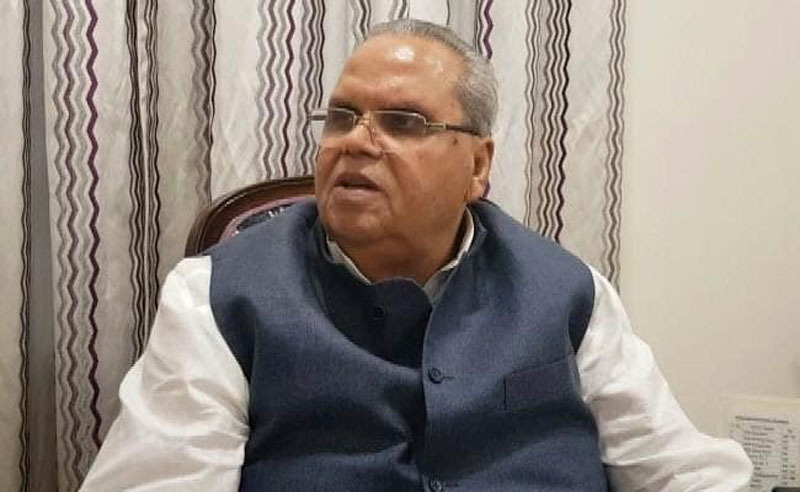 NEW DELHI, Feb 19: Jammu and Kashmir Governor Satya Pal Malik today said the ongoing operations by security forces were against Pakistan-sponsored terror groups and their masters and “not against Kashmiris”, who are equally determined to wipe out the menace of terrorism. Talking to PTI during his brief visit to the national capital, Pal said the situation in the militancy-hit State was fast returning to normal. “Things are improving in Jammu and Kashmir and those responsible for the February 14 dastardly terror act have been punished by the security forces,” he said. Malik thanked various State Governments who have stepped in at a crucial time and are helping is protecting the lives and property of Kashmiris residing in those States. “I have always maintained that Kashmiris also want to wipe out the menace of terrorism from the State,” he said. He maintained that it was a fight against Pakistan and its policy of supporting terrorism. He pointed out that liaison officers of the Jammu and Kashmir Government in Delhi, Jaipur, Bhopal, Chandigarh, Aligarh, Bengaluru and Pune have been coordinating with the Kashmiri students studying at these places and have ensured that no untoward incident takes place. There were some incidents after the February 14 terror attack on a convoy in Pulwama in which 44 CRPF personnel were martyred. “There have been some anti-social elements which have been attempting to stoke a communal fire but these have been nipped in the bud,” he said. The Governor also spoke to Deputy Inspector General (South Kashmir) Amit Kumar and Brigadier Harbir Singh and complimented them for leading the force from the front. Both of them were injured during Monday’s encounter at Pulwama in which the mastermind of the February 14 terror strike was killed. “I have also complimented the General Officer in Command Lt Gen K J S Dhillon for talking straight during his press conference. I hope that the message will go straight where it should go,” he said. Lt Gen Dhillon had said that anyone picking up gun in the Kashmir valley will be eliminated by the security forces. Meanwhile, Malik has lauded the Army, police and paramilitary forces in neutralizing militants in an encounter at Pinglena village of Pulwama. He has expressed grief on the martyrdom of the Army and police personnel in the said operation and prayed for eternal peace of the departed souls and expressed sympathy and solidarity with family members of the martyrs. Malik spoke to Brigadier Harbir Singh, Commander 12 Sector RR, and Amit Kumar, DIG South Kashmir and their family members and inquired about their well being. He has wished a speedy recovery to them and other security personnel injured during the operation. Earlier, the Governor had deputed Advisor, Vijay Kumar to visit them in Srinagar and ensure that the best possible medical attention is provided to them and other injured personnel in the incident. Malik observed that it is a matter of pride for the nation that senior officers from the Army and security forces are leading from the front in anti-militancy operations. He particularly appreciated Brigadier Harbir Singh who had voluntarily returned from leave to lead this operation.